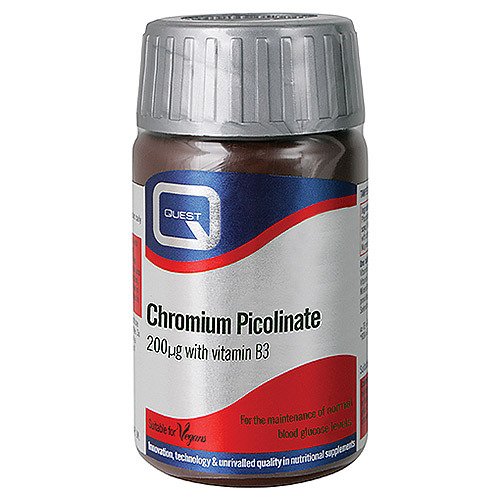 Quest Chromium Picolinate provides 200mcg of chromium picolinate along with vitamin B3 (niacin). Chromium is required to maintain normal blood glucose levels. Niacin works alongside chromium and contributes to normal energy yielding metabolism and the reduction of tiredness and fatigue. Bulking agent: Microcrystalline Cellulose, Dicalcium Phosphate, Niacin (niacinamide), Magnesium Stearate, Chromium Picolinate, Anti-caking Agent: Silicon Dioxide. Take 1 tablet daily with food swallow with water. Food supplements should be used as a substitute for a varied and balanced diet and healthy lifestyle. Below are reviews of Chromium Picolinate - Vitamin B3 - 30 x 200mcg Tablets - Best before date is 31st May 2019 by bodykind customers. If you have tried this product we'd love to hear what you think so please leave a review. 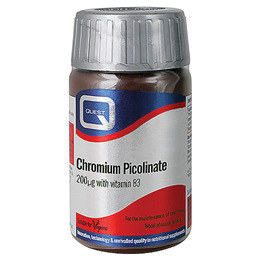 Quest Chromium Picolinate provides 200mcg of chromium picolinate along with vitamin B3 (niacin). Chromium is required to maintain normal blood glucose levels.